The heightened awareness in today’s society about the importance of protecting and caring for our environment has created a trend towards the development of non-polluting vehicles, clean spaces and buildings that are as environmentally friendly as possible. 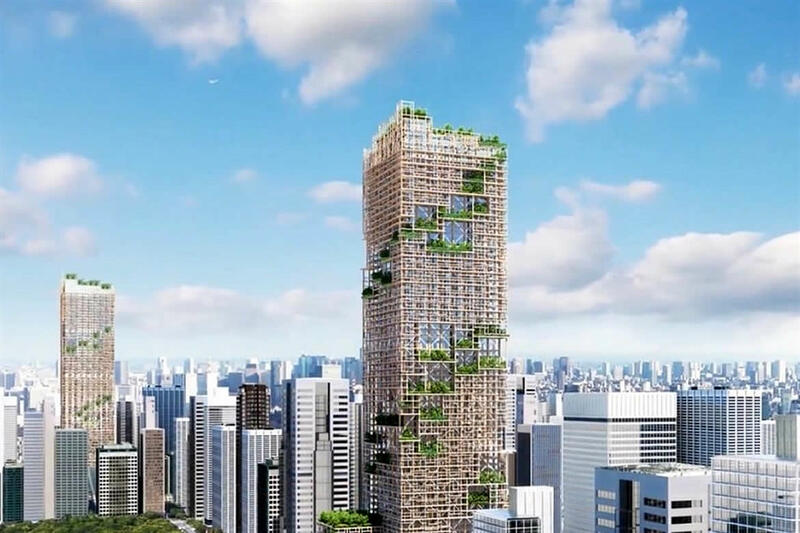 With that in mind, we have decided to focus on a new skyscraper project in Tokyo that, once completed, is set to become the tallest wooden building in the world. Japanese company Suumitomo Forestry assures that its 350-metre-tall tower will be completed by 2041, to mark the company’s 350th anniversary. The estimated total cost of this building, known as the W350 Tower, is around $5.6 billion. The 70-storey skyscraper will feature a hybrid structure made up of 90% wood and 10% steel. The 455,000-square-metre construction will house 8,000 apartments, hotels, offices and shops, with trees and vegetation growing on the balconies of each floor. A tubular structure with diagonal vibration-control braces and steel columns will protect the installation from earthquakes. The total construction costs are expected to reach €4.5 billion, approximately double what it would cost to build a conventional tower of the same size. Although the Japanese company expects the figure to come down before 2041 as a result of technological advances. According to the company, ‘The aim is to create environmentally-friendly cities that use timber and are turned into forests, through greater architectural use of this material in high-rise buildings’. The waterfalls and abundant foliage will convert the interior of the W350 project into a lush forest. The incredible building will also be fireproof, the wood used in its construction able to withstand flames for up to three hours and the water from its waterfalls and plants preventing the building from burning easily. The Japanese government champions the use of wood for the development of infrastructures among builders, architects and the population in general, having passed the Law for the Promotion of Wood in Public Buildings back in 2010 to help promote this initiative and achieve its final objective. And it is not just Japan where the concept of wooden skyscrapers is taking off. The past decade has seen an explosion in the number of wooden buildings being erected worldwide. The idea of creating a wooden building is not a new one, with several already in existence. The current world record for the tallest wooden building is held by Canada, with its 50-metre-tall construction, the 18-storey Brock Commons Tallwood House, a student residence in the University of British Columbia campus in Vancouver, which has been dubbed the tallest timber building in the world. At Codina Architectural we believe that the future will undoubtedly lead us to the creation of ecological cities that respect the environment. And architecture plays a fundamental role in that future.